Do you know what it means to have dense breasts? Most women know to get a yearly mammogram starting at 40 years old. But they don’t generally know what it means and what they should do if they receive a diagnosis of having dense breasts. The density of breasts is not reflective of how heavy and firm your breasts are to the touch, but how the tissue in your breasts appears on a mammogram. Dense breasts are higher in fibroglandular tissue (a combination of connective and glandular tissue) and lesser in fatty tissue. 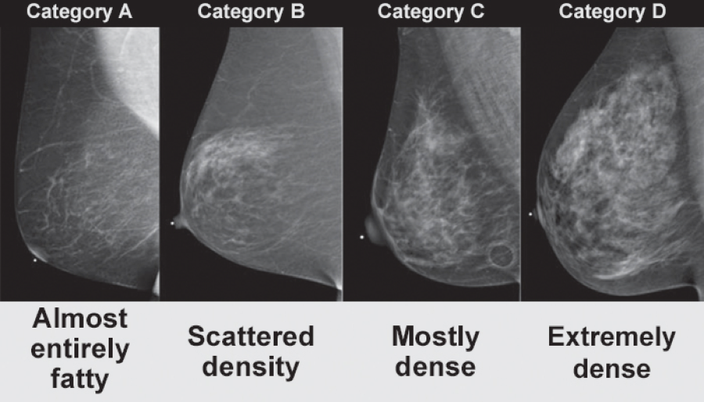 The images below show how the differences in breast density appear on a mammogram. Fatty breast tissue appears black, while dense tissue appears white. As you can see, it’s harder to view the intricacies that lie within a dense breast. This makes it difficult to diagnose cancer through a mammogram because cancer also appears white! What are the risks of dense breasts? It is normal and relatively common for women to have dense breasts and is definitely not a diagnosis that should trigger extreme worry. Instead, women with dense breasts should be aware of the risks and proactively monitor their breasts for any abnormalities. Having dense breasts not only obscures a malignancy on a mammogram but makes you five times more prone to developing breast cancer (although doctors are unsure why). Thankfully, there are other imaging options besides mammograms that increase the accuracy of a diagnosis, including digital tomosynthesis, breast MRI, breast ultrasound and contrast-enhanced mammography. Who is at risk for dense breasts? Breast density loosens with age, so pre-menopausal women in their 40s and 50s are at a higher risk for dense breasts. Breast density notification laws have been enacted in 28 states – they require that women be informed of their breast density after having a mammogram. Educating yourself about the conditions your body is susceptible to may seem scary, but it will allow you to proactively take the necessary steps to ensure your long-term health. Preventive care is key: Make sure you get your annual mammogram screening and clinical breast exam. If you already know you have dense breasts, you should ask your physician if having additional breast imaging tests makes sense for you. Be sure to find a doctor with expertise on breast density whom you can trust and speak with frankly on these topics. The Janet Knowles Breast Cancer Center at MD Anderson Cancer Center at Cooper specializes in providing expert breast cancer prevention, detection and treatment services. One of the newest programs at MD Anderson Cooper is the Dense Breast Clinic – where women can receive a thorough evaluation of their breast density, get answers to their questions, receive recommendations about breast cancer screenings and obtain an evaluation of their breast cancer risk.